We now provide support for bulk imports, of your TROCADERO listings, to eBay's Turbo Lister listing and upload tool. 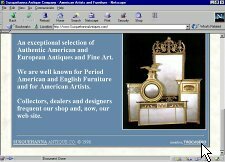 See "Auction Tools". discreetly on premium account pages. to informational and registration pages. Welcome to TROCADERO's Express Storefront. If you are reading these pages, you are likely interested in opening your first storefront or you may wish to upgrade to a storefront with TROCADERO - the leader in cooperative merchandising innovation and promoting member-specific branding. We at TROCADERO would like the opportunity to provide you with your storefront. An Express Storefront on TROCADERO is easy to start, setup and manage. Just follow the instructions when you register now and let us know at admin@trocadero.com if we may be of assistance. We are a retail venue (auctions are facilitated, but not at the peril of retail values or purpose). TROCADERO does not take commissions on sales (you keep the rewards of your investment). Our Enterprise account is $70 per month. It and the E-Commerce account ($45 per month) are free from exit links and advertisements in the member's version. There are two versions of every listing and catalogue page - one that refers traffic back which originates from TROCADERO and the other that retains traffic referred directly to a member's site through their own marketing effort and expense. TROCADERO reserves the right to place advertising on both the TROCADERO and member versions of Business ($20 per month) accounts. We discuss the differences between our account types further on the following pages. All catalogue accounts may add up to 800 items without excess listing charges. 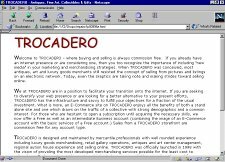 TROCADERO is unique in the marketplace for both respecting and promoting its clients' individual branding. For members with their own domain name, TROCADERO incorporates the domain integrally in links to members' pages. Our priority is one with our client: maximizing performance and value for the member's own web endeavors. We do not place our own brand prominently on member pages and we do not include links inviting traffic (earned by individual members' own operations, advertising or trade show efforts) to depart the member's site.